J.H. + J.H. = Friend - AIM Services, Inc. I like that there is no road map with AIM, we just try to provide a normal existence for those we support. We all thrive on this normalcy. 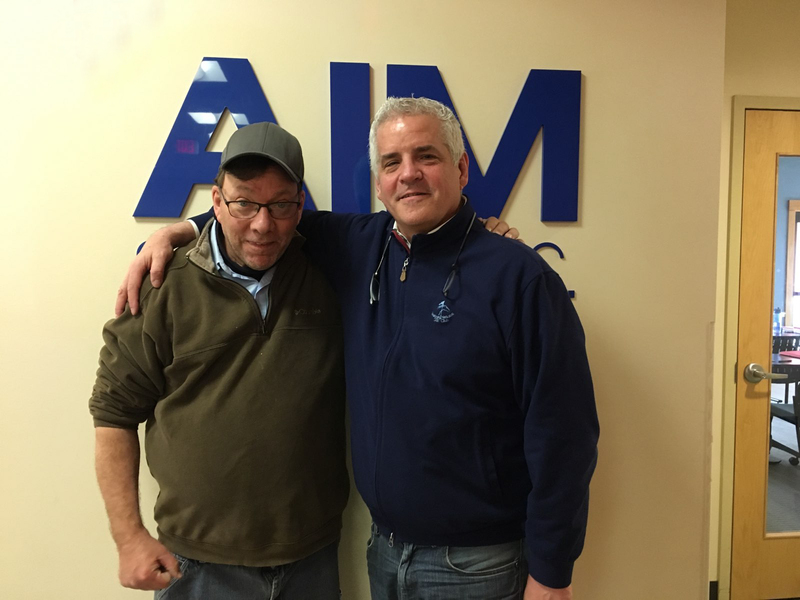 At AIM, our services are hinged upon the relationships we build with those we support. During our New Hire Orientation, we inform every new staff member that they may even get sick of the word ‘relationship’. Yet the meaning behind it is deep and true; of which you could never tire. Our agency represents people discovering their power of potential; they are given the opportunity to explore all their hopes and dreams. We, the staff, are the lucky ones standing by their sides supporting them, encouraging them, and holding them up. In the end, our lives are changed. Jake H and Jim H are an incredible example of the relationship that forms between a person we serve and their support staff. They represent one of the instances where a near perfect match is made and two lives are forever altered. What is immediately unique about this duo is their past. Jake and Jim, both now grown up, knew each other in high school. Jake knew Jim’s parents and all of his siblings, of which there were 9. Jake explained that he and Jim share many similar experiences. He takes Jim down his old street past his family home and together they reminisce about the old days. We bond. He (Jim) hugs everyone and wants to know them. People remember him. Sitting together with Jake and Jim is a joyful experience. You can feel and see them feed off one another, speak an “inside” phrase that’s over your head, and hear through their words the care they have for one another. In the winter of 1976, shortly after graduating high school, Jim was in a car accident that placed him in a coma for several months. During this time, his family was with him every moment. When he awoke and was ready, he was moved to a rehabilitation center where he relearned how to do everything; walking, talking, eating. There are lots of different viewpoints, says Jim, but I think God kept me here for a reason. I’m happy and I want others to be happy. I like my life. Jake speaks admirably of Jim. This is not a typical relationship. We have our inside jokes and phrases. We get in the car and decide where he wants to go that day. Sometimes it’s just to go for a ride. Sometimes it’s out for wings, or taking a seat at Stewart’s to talk to people; it’s always an adventure. Nothing is scripted, we just look for something normal, and I am pretty sure that is AIM’s goal. Jim hugs everyone and says hello and asks them when they graduated or what they’re proud of in their life. Jim is remarkable; he holds no grudges and always rolls with the punches. He accepts people always. I can anticipate his (Jim’s) needs, and I guess that’s what friends do. Jake’s respect for Jim is evident. He encourages him to share his interests in which he has great pride. Jim’s faith is an important piece of who he is. He attended St. Clement’s in Saratoga Springs when he was a child and is now a member of the church choir. He shared his family history of having three ordained catholic priests for uncles. Prayer is important to him. Jim’s take on life is infectious. He has known great pain and change in his life, yet he chooses to be happy and to look upon his experiences and his injury as a gift. He looks upon all those that work with AIM as his second family and upon Jake as his friend. He’s cool. He shares how Jake watches “hoops” with him and how they recently stayed up really late to watch a game. It was out of the ordinary for Jim and exciting. Jim reminisces about his basketball career in high school. “Jim the animal H”, what I lacked in talent I made up for in hustle. Jim’s senior year of high school he was named “Best Personality” and “Most Improved” in soccer. In that regard, not much has changed, as his personality is still the best! Although March is Traumatic Brain Injury Awareness Month, it is a responsibility of AIM’s to grow awareness every single day. When asking Jim what he would say to someone just beginning their journey after a traumatic brain injury, he said I would say ‘Hi’. I would learn what is going on in their life and get on their wavelength. I like what the Lord has dished out for me and I want them to be happy. They can talk if they are ready. Jim’s words are a reminder that there is so much support out there for individuals experiencing a brain injury. Although we have a lot further to go in providing the best possible support for this population, the story of JH + JH highlights that we have helped some great things happen. In telling Jim’s story, together we help grow this much needed awareness of those who have sustained a brain injury. Jake’s introduction to AIM is distinctive. A practicing lawyer, he sought a connection to something more to supplement his established work. He called a friend at AIM and asked where he could help. He took a part time Direct Support Professional role with one caveat: to be open and to learn. Not far into training, it was evident to AIM that Jake had something special to give, and that AIM was the perfect fit for Jake. The AIM Staff are amazing and helped match me with people to whom I feel a connection. I like that there is no road map with AIM, we just try to provide a normal existence for those we support. We all thrive on this normalcy. Working with AIM has made a profound impact upon Jake’s life and the way he sees people in general. I look at people so differently outside of AIM now. I recognize that everyone has something going on in their life and they need someone. It has tempered me to think before acting. AIM is thought provoking. I look forward to this every day. Jake is a living testament that no one person is “over qualified” for a Direct Support Professional Position. Often it is the opposite; people are under-qualified for a heart connected role of selflessly giving so that another may receive. When asked what’s next on their list of adventures, they weren’t sure. Jake is still learning Jim’s interests. He knows Jim loves crowds, so he tries to bring him places where that occurs. Jim is a baseball lover. Although not attached to one team, but rather the love of the game, Jim would like to get to Boston for a game. Jake and Jim, we can’t wait to hear about Boston and all the great people you meet. Here’s to your next adventure! Thinking of joining the AIM family? Click Here to learn more about our working at AIM.